(Topic for this week is Antique Bird Quilts). 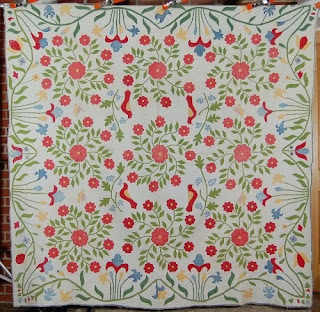 This is Quilted Joy a reproduction of a joyful antique Rose of Sharon quilt in my collection (see below). Made for the American Quilt Study Group's Civil War Quilt Study and is part of the traveling exhibit. Right now it is on display at the Stillwater Museum in Stillwater, Oklahoma. Hand applique and hand quilting. 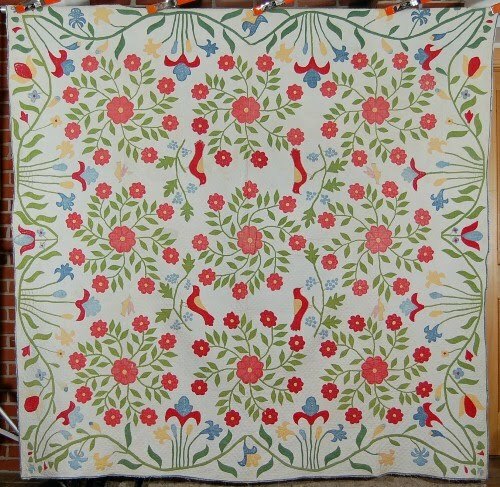 This quilt is available as a hand applique class/workshop and the antique quilt is the star of my antique quilt trunk show: Birds and Blooms showcasing amazing mid 1800s antique applique quilts. Close-ups of the repro (above) and the antique (below). I reduced the block size and number and scaled down some details (3 leaves on Rose stems instead of 5) but tried to faithfully recreate the folk art charm and exuberance. 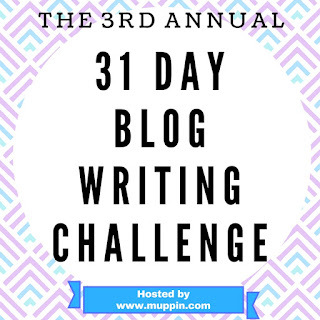 **I'm so happy to be sharing these treasures with you and participating for the 3rd year in the 31 Day Blog Challenge. Click on the photo to go to the main page and connect with others sharing their quilts (old and new) and other creative work. Thanks Cheryl Sleboda for hosting this again and inspiring us to share.